Still struggling with balancing work and having time/energy to cook, but give me a few more days and I'll be back! Anyway, I bought all these blueberries, and was going to make a tart, but just wasn't feeling using a stick of butter. So I made a cobbler. 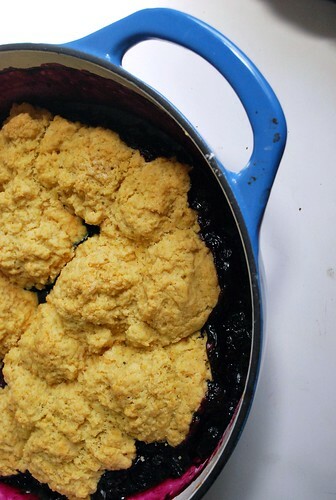 A cobbler has a biscuit-like topping, and is over fruit. It's super easy and quick. And good with ice cream. Combine the flour mix, cornmeal, xanthan gum, baking powder, baking soda, salt and sugar. Cut in the butter, until it's the size of peas. Stir in the milk. Toss the berries with the sugar, cornstarch and lemon. 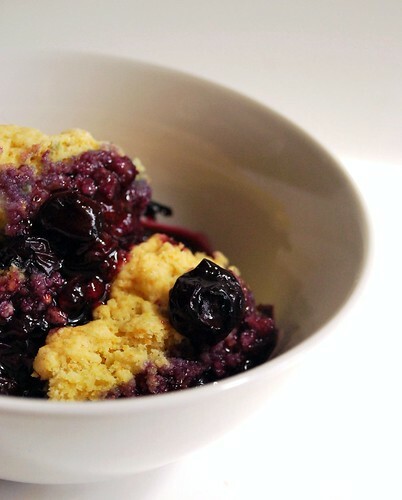 Plop the biscuit dough by teaspoons on top of the berries, then brush with a little more milk and sprinkle with sugar. Bake 45-50 minutes. Cool slightly, then serve warm as is or with ice cream. Please tell me you are working on a cookbook. I have been so UNIMPRESSED with the gluten free choices out there. I LOVE all your recipes..they always turn out amazing, even cooked at 7,000 ft! Thank you and can't wait to try this one! Impressive and beautiful as usual! I've have just recently learned the joy of cobbler! I love that yours included cornmeal and new love for me as well.